If you’re in the market for a new carry-on luggage and want something a little different, then I have a real winner for you. The best spinner carry-on luggage right now is the Eagle Creek Tarmac AWD. This is probably one of the most thoughtfully designed bags I have ever seen. Everything has a reason for being on there and everything is useful. 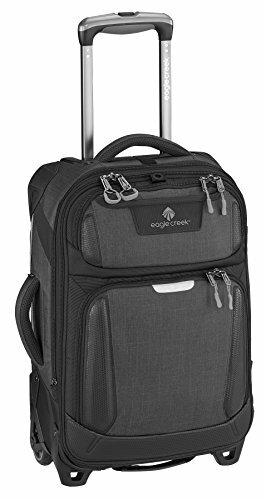 The Eagle Creek Tarmac AWD (or all-wheel-drive) is the 4 wheel spinner version of their Tarmac series luggage. It is sort of a mix of hard-side luggage and soft luggage. This is because the belly of the bag is made of a durable polycarbonate material that is incredibly hard to damage. This also gives the bag some really good structure. The back side of the bag is made of a very durable Bi-tech fabric that is also really durable (as is everything Eagle Creek makes). But the outside of the bag is where this bag really excels. First up is one of the most solid pull handles in the industry. It is solid and has a great grippy rubber handle that retracts into a protected inset area of the bag. On the back of the bag there is a large exterior pocket. The nice thing about this pocket is that it is 3D (meaning that it actually has some volume). I tend to store more toiletries bag in there as it is the perfect depth for it. Within this pocket is a small document/iPad/tablet pocket which has come in handy to carry train tickets, passports and other important stuff. The last pocket is on the very top of the front of the bag right below the handle. This area is perfect to store sunglasses, passports and other small things. And the bag actually includes an integrated keyring loop (with a bottle opener on it!) Within the pocket is also an elastic and plastic “coat keeper.” This little device pulls out of the pocket and then loops around the handle of the bag to secure a coat or other garment to the top of the bag. These are the little touches that make this bag really shine. The whole bag just feels premium with solid zippers and buckles throughout. The wheels on it are decidedly chunky, with inline skate style wheels what actually have a form of treads on them for rougher terrain. All around I think this is probably the best spinner carry-on luggage on the market (unless you want a full hard body bag). 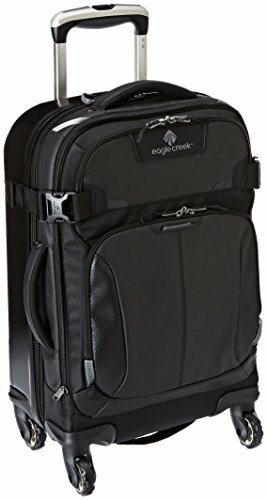 The Eagle Creek Tarmac AWD carry-on is available in a US domestic carry-on as well as an International carry-on which is a bit smaller for those budget European carriers. If you are unsure what size you need for your region, check out our carry-on size chart with all of the major airlines in the world. The International carry-on version is only available in a two wheel design since it needs to remove two wheels to retain space inside the bag.